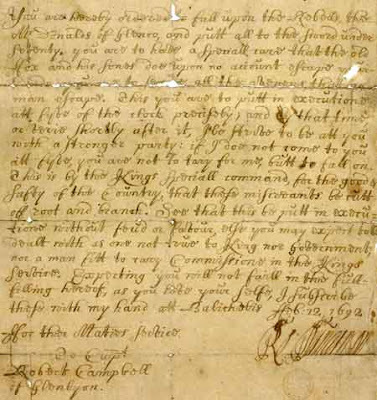 The National Library of Scotland has chosen as the centerpiece of an exhibit of "nine cultural treasures" one of the most infamous documents in the country's history: the 1692 government order commanding the notorious Massacre of Glencoe. The chilling contents of this death warrant stand as a horrific example of state sanctioned murder. In August of 1691 the English crown ordered the chiefs of all Scottish clans to take an oath of allegiance to William III by year's end. This proclamation reflected the desire of the monarchs from the House Of Orange-Nassau to crush the recently deposed Stuart rulers. The unfortunate Alasdair, Chief of Clan MacDonald of Glencoe, swore his fealty to William just over a week into the new year of 1692. (Bureaucrats, later revealed to be part of the murder plot, deliberately delayed the efforts of the clan leader, known as informally as MacIain, to meet the deadline.) This trifling delay allowed a scheming Secretary of State to make an example of the MacDonald clan by ordering that all "under seventy" die by the sword, and "these miscreants be cutt off root and branch." The man charged with executing the murderous order was Captain Robert Campbell, 5th Laird of Glenlyon. Campbell was a wastrel: a bankrupt, drunken gambler who had lost his fortune to unwise investment and endless extravagance. 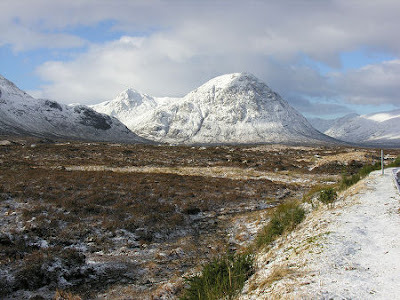 His last remaining holdings had been looted by soldiers belonging to the MacDonald of Glencoe clan in 1689. This forced the desperate Laird, now 59, to seek humiliating employment as a foot soldier for the Earl of Argyll. As a result, there was no love lost between clans MacDonald and Campbell. The bitter cold Winter of 1691-92 found Major Campbell's regiment, most probably by design, billeted on land belonging to his enemy, MacIain. The Clan MacDonald Chief extended traditional Highland hospitality to The Earl Of Argyll's soldiers, despite the history of bad blood between himself and their commanding officer. For at least two weeks Campbell and his men depleted the precious Winter food supply of their hosts, and drank and toasted to their good health. 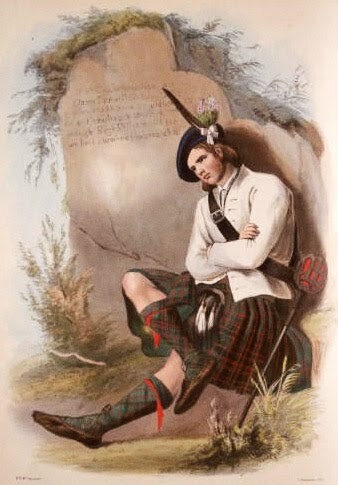 Captain Campbell bunked in MacIain's own home, and even proposed arranged marriages between young members of the two clans, ostensibly to end their ongoing feud. Campbell's conduct was revealed as a ruse upon receipt of the soon-to-be infamous order from his superior officer, Major Duncanson. Campbell and Duncanson spent the evening of February 12, 1692 dining and playing cards with their unsuspecting hosts, even making plans for a festive meal the following evening. But at 5am on February 13 the killing began. The hospitable MacIain was stabbed to death before he could arise from his bed and alert his family to the soldier's treachery. 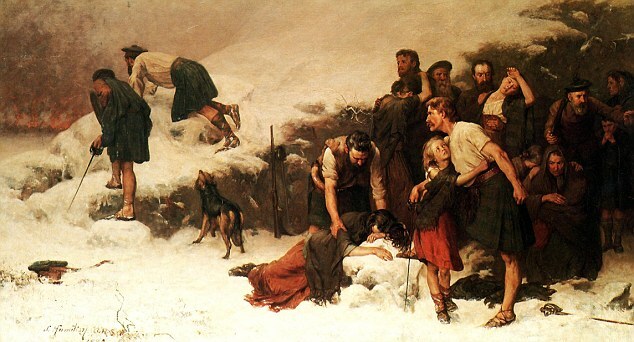 In all, 38 members of clan MacDonald were slain as they attempted to escape from their former guests. Another 40 family members, mostly women and children, died from exposure to the Winter's cold as they fled the dwellings they had generously shared with those who now cruelly set them ablaze. The document authorizing the murder of an entire clan, guilty only of being convenient victims for a government bent on consolidating control, will be on exhibit at the National Library of Scotland until early January, in low light conditions and with flash photography banned. In a perfect world, such careful preservation of a document detailing the depravity of the power mad might prevent the repetition of such evil events. But our world is sadly far from perfect. Having relatives on both the Stuart (Stewart) and Campbell sides, I must wish all families of the slain forgive the one member of our family who chose the wrong Master to obey. May all future clans share the Camaraderie of Peace and Progress rather than Arms and Misunderstanding.